Broadway between East 4th Street and Astor Place was changing fast in 1895. 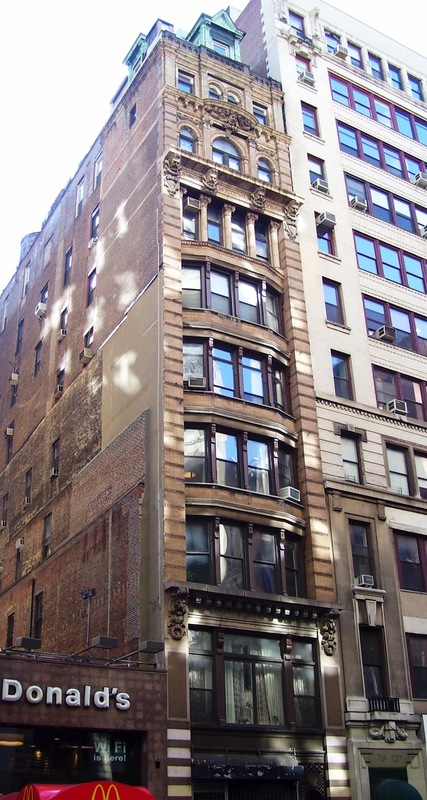 A half-century before the area was among the most exclusive residential areas in Manhattan. Then, around the time of the Civil War, the homes were converted or razed and three- to four-story commercial buildings lined the thoroughfare. Nearly as quickly as these went up, they started coming down. As the century drew to a close taller, modern skyscrapers—some over eight stories tall—replaced the earlier business buildings. Broadway was changing fast. On March 15, 1895 Engineering Review reported that “John Keller, 46 Hart Street, Brooklyn, will erect a 9-story brick store at 722 Broadway at a cost of $65,000.” The “brick store” would be more than that. Keller was president of Keller Printing and the new building would house his offices and printing operation, other loft space for rental income and a retail space at street level. Keller commissioned the German-born architect Francis A. Minuth to design the new structure. What resulted was a slim 9-story Renaissance Revival building with attic, topped with a domed tower. At the time when late Victorian tastes demanded over-all decoration and imagination-catching details, Minuth filled the bill. The alternating bands of granite and limestone that formed the side piers of the first floor created a stark striped effect. Above, cast iron window framing allowed for expanses of plate glass beneath a bracketed cornice upheld by robust lions’ heads and wreaths. The piers continued upward in light-colored brick with decorative terra cotta bands. Between, the façade bowed out in a continuous row of sunlight-drenching windows. 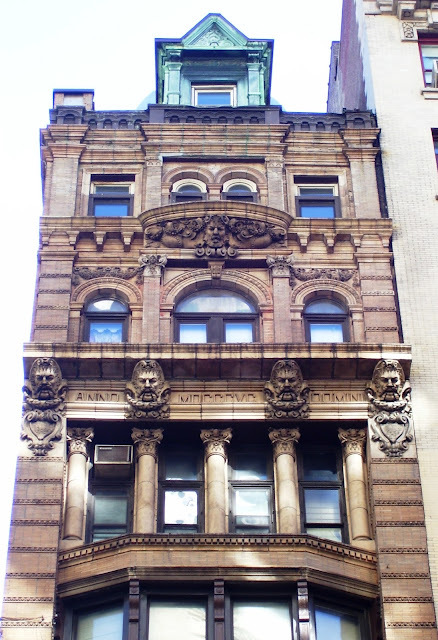 Above the seventh floor, where stylized Corinthian columns replaced the slender cast iron supports of the floors below, marvelous terra cotta heads serve as brackets for the overhanging cornice. Peculiar at least, their “hair” is leafy foliage and the wreaths below their chins are held up by their mustaches and ribbons held between their teeth. The arched openings of the floor above are separated by square brick engaged columns with Corinthian capitals—one featuring the face of a youthful maiden, the other a snarling lion. Lush fruited terra cotta garlands decorate the spandrels of the outer windows. A glowering head in the hearty base of the curved balcony at this level sticks out his tongue at the passing shoppers on Broadway below. Above it all, a prim angular copper clad dormer fronted the tower. Obtaining Keller’s size labels would be convenient for several apparel firms who moved into the building. Fischer & Co. was here in 1900, makers of women’s clothing. That year the wholesaler advertised 1,000 tailor-made suits and skirts available to the public. Along with Fischer were the clothing manufacturers H. L. Herschfield & Co. and M. Resler. In 1904 Rose Landes & Co. was in the building, making ladies’ hats. In 1912 the brick tower with its interesting dome was removed from behind the copper dormer. Architect Earl C. Maxwell oversaw the rebuilding of the parapet wall along the roof line at the same time. In the meantime, for the most part, the building continued to fill with apparel concerns. The ground floor space would be home to Truly Warner men’s hat store for over a decade, into the 1920s. Meanwhile, upstairs were B. 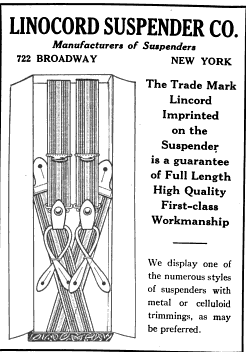 Light Company, clothing makers, run by Benjamin Light; the Linocord Suspender Company that made suspenders, belts and garters; and Rhine & Heiman makers of youths’ and men’s clothing. Truly Warner "Hatter to Mr. Goodresser" operated its hat store here for years. 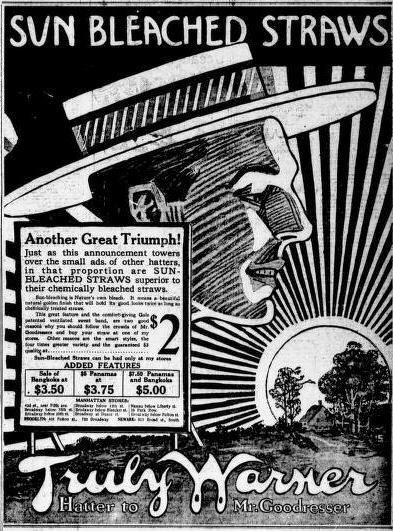 Their straw boater was selling for $2 in 1918. In the 1930s apparel makers Saperstein & Brothers, Samuel Frankel, and Eli Feldstein were doing business here; and in 1942 S. Schneider took an entire floor for its millinery factory. But times were changing for the hat and apparel industry. By mid-century the garment district had established itself along Broadway and 7th Avenue in the 30s. The neighborhood around No. 722 Broadway experienced decades of neglect as more industrial uses were found for the old structures. But if the address of No. 722 Broadway proved anything in two centuries, it is simply that Broadway is ever-changing. By the 1980s the Noho district had been rediscovered as artist galleries and studios opened. Buildings were slowly restored and renovated, and trendy cafes and clubs moved in. In December 1980 the building was converted to one “joint living-work quarters” per floor above the first floor. And today Francis Minuth’s thin and exuberant building looks much as it did a century and a quarter ago when Broadway was changing—again. Such rare and historical buildings with beautiful architectural designs are really hard to find nowadays.